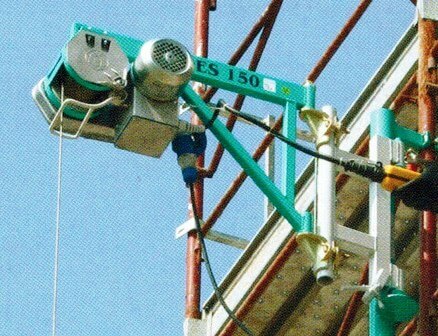 The ES 150 Hoist with clamps for easy attachment to any scaffold pole. 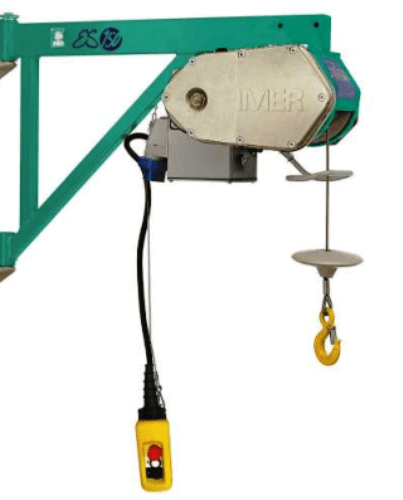 The ideal scaffold hoist from Imer. Maximum lifting capacity of 150kg. 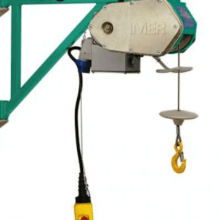 The Imer es150 scaffold hoist is a fixed bracket hoist and are perfect for lifting applications which don’t need an extension to the framework. Imer scaffold hoists are regularly used on both small building sites as well as larger construction developments; they can also be used where ever a scaffold tower is in place. The 150kg lifting capacity of the es150 is ideal for getting your tools and materials up to different levels of the scaffold tower with minimal effort. This quite compact scaffold hoist is possibly one of the smallest of its type measuring 330 x 770 x 520mm (W/L/H) and weighing in at 39kg. With a top lifting of 150kg the ES 150 comes complete with special clamps for securing directly to a scaffold pole for speedy attachment. The maximum working height of the ES 150 hoist is 25 metres with a lifting speed of 18.5 metres per minute when holding a full load. This model comes complete with a 5 mm diameter wire rope which is 26 metres in length. 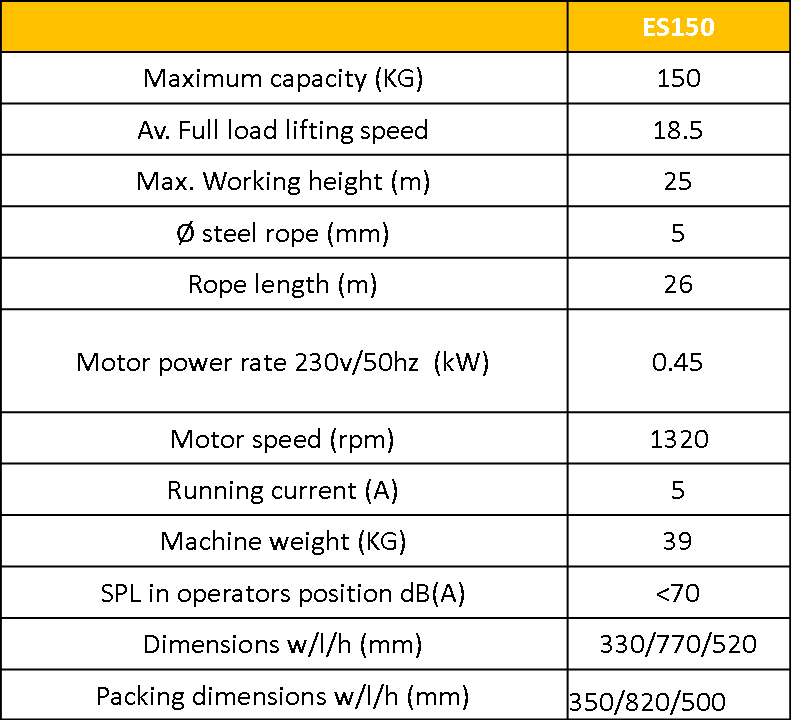 Other standardised equipment for the ES 150 include an IP67 plug; Upper limit safety device; scaffold clamps and a push button control pendant with a 1 metre cable to IP65 standards. This particular hoist is also available with a trolley system to enable it to be used with a gantry frame set up. There are a range of accessories available to compliment scaffold hoists, these can be viewed on the gantry and scaffold hoist accessories page (coming soon). 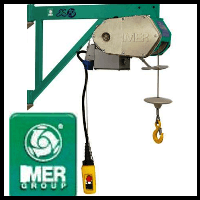 If you would like to know more about this hoist, to ensure it is the best hoist for your lifting applications then please do not hesitate to get in touch, our friendly team are always ready to offer advice, information and quotations on all their products.